When deciding on wedding tents for rent, it’s not only the space that’s important. Here are the finer details you’ll need to consider before hiring a wedding tent. In a previous article, we discussed the questions to answer before choosing the best tents for wedding receptions. 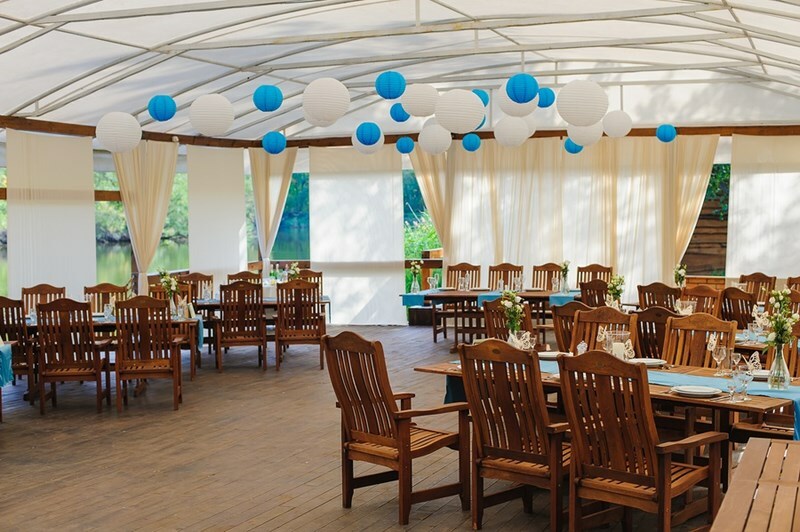 Before making your final choice between wedding tents for rent, you should also think about the finer details – things like flooring, lighting, heating, and decorations. All such details will affect wedding tent rental prices, and so you should ensure that they’re all included in the quotes you receive – a cheap quote could be misleading, and an expensive quote could include things that are unnecessary. In this article, we’ll look at the finer details of wedding tent hire that you simply mustn’t ignore. I’ve been to weddings where it had been decided to cut costs and do without flooring. One springs to mind in particular. The wedding was in the summer, so why was there any need to have expensive flooring? The evening before the wedding, it rained. Not a lot, but just enough to make the ground a little more than damp. By the end of the evening, the ground inside the tent was like a quagmire. Women were losing the shoes off their feet midway through the ‘Locomotion’. There is a range of flooring options available to suit all budgets and requirements, and you could also consider a partial floor, providing a dance area (where most mishaps might take place, especially with guests wearing high heels). Most wedding receptions continue into the night, after the sun has gone down and before it rises the following day. Even if you hold your reception in a clearspan tent that lets in the light of the moon and stars, your guests could still feel like they’re dancing in the dark. And I’m sure that your caterers wish their culinary creations to be enjoyed visually as well as tasting spectacular. There are plenty of lighting options possible. Soft mood lighting, lanterns and twinkle lights are just a few. You could opt for more theatrical lighting, or have dimmer switches to help motivate your guests to dance. While we’re discussing lighting, remember that you’ll need a power supply to switch the lights on: you may need to consider a generator. Even in the largest wedding tents, there is no need for guests to get cold in the winter. In the summer, mid-afternoon could become unbearable under canvas. To ensure that your guests are comfortable, the answer is appropriate heating and cooling. You could opt for fans in the summer and furnaces in the winter, or provide the ultimate comfort of climate control. Your choice may depend on your budget, but should also take into consideration safety concerns – for example, patio heaters are easily knocked over, so we wouldn’t advise using them. Think about how you want your wedding tent to be decorated. You may decide on providing your own decorations, though don’t forget all will have to be removed before we can take down the wedding tent. For the larger decorative items – room dividers, tent wall curtains, backdrops, and ceiling liners – our sewing shop is able to make custom drapes that will ensure your wedding is unique in every way. How much do wedding tent rental extras cost? These extras are what transforms your wedding from good to spectacular. We can tailor to your budget, and provide advice on what is really necessary for your wedding, style of tent, number of guests, time of year, and a whole host of other factors that could affect your big day.